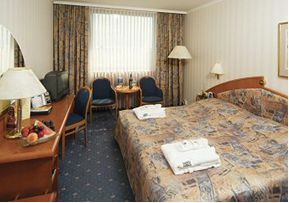 All rooms are air-conditioned and equipped with smoke detectors. Standard equipment includes mini bar, safe, radio, alarm clock, direct-dial telephone with a data port for a computer (connector RJ11) and hairdryers in the bathrooms, wireless high-speed internet connection, interactive television system with wake-up, satellite channels and pay -TV. 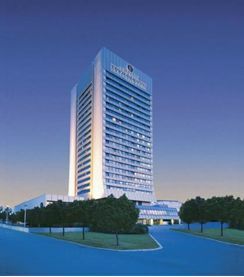 The Corinthia Panorama Hotel offers many extra services and facilities to its guests. Top Deck – Health and fitness center offering massage, sauna, gymnasium and Jacuzzi or pool with panoramic view. Hairdressing and beauty saloon, casino, theatre and concert reservations, extensive conference facilities, conference and breakout rooms. Hotel is located in a quiet residential area, 15 minutes from the historical centre of Prague, only four stops from the city centre by metro. From metro station Pankrác situated 2 minutes walk away from the hotel take a metro (line C) and go 2 stops to the metro station Vyšehrad. Prague Congress Centre is located next to the metro station. The journey should take up to 10 minutes.